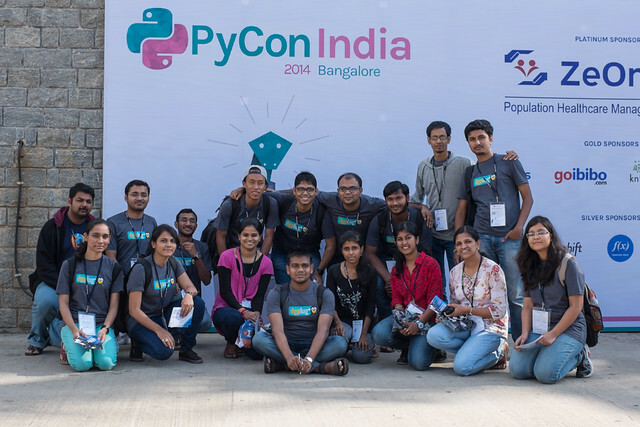 Last week we had PyCon India in Bangalore, from 26th to 28th September. I reached the hotel on 25th morning. Michael Foord (voidspace) and I went out for dinner but got stuck in rain while coming back. Trip back to hotel was an adventure. I met Michael and Noufal in the hotel lobby and went to the venue in Noufal’s car. First few hours went with meeting and talking with so many old friends. I did my workshop “Document your code” after lunch. Most of the participants were from industry than students this time, which meant less errors due to typos. Overall the workshop went well, I still have to wait for the feedback from attendees. Keynote time for me. In the past few weeks I made sure that I time it well but somehow spoke slowly and missed a few things in my talk. The title of the talk was “Moments from my ongoing journey”, the slides are available and you can watch it too. The idea behind the talk was to share stories about the people and projects, who helped me to learn more and to tell (the students mostly) that it is a journey. The journey is more important than the point where we are in life. We always underestimate what we can achieve in long term and over estimate what we can do in short term. I also found that the most of the participants are first timers in PyCon. Joined the food testing team and was blown away with the quality of the food. We can easily call PyCon a Food conference any day, I must thank Vijay for the excellent quality of the food. We had a PSF members meeting in the afternoon, around 40 people attended the meeting. We discussed various queries people had related to membership models and how PSF works. Just like most other conferences I spent the time in the hallway talking to people than attending the talks. We can watch them now on youtube. Later in the evening we had speakers and volunteers dinner, good food once again. Met Noufal and Michael in the breakfast room in hotel and went in ahead of time. The day started with Michael’s keynote. After the keynote we all moved to the hallway. Few students talked about the final year projects. Oh well, you can call it annual dgplug.org meeting too. 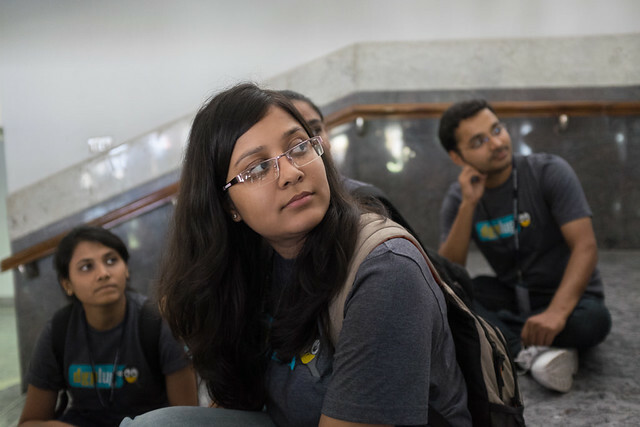 We meet during PyCon India in the staircase, photos can be found in twitter. As usual we discussed about current projects going on and the near future goals. The following picture is of the group members in front of the main banner. We also met few summer training students from this year’s summer training for the first time. In the evening there was the AGM for PSSI. PyCon India has become the best place to meet old friends and make new ones in India for me. Met Parthan this time after 4 years iirc. Met all other Python friends in the conference. This is conference run by volunteers, we all together can make it even better next year. Remember to join in the mailing list and participate in the discussion there. 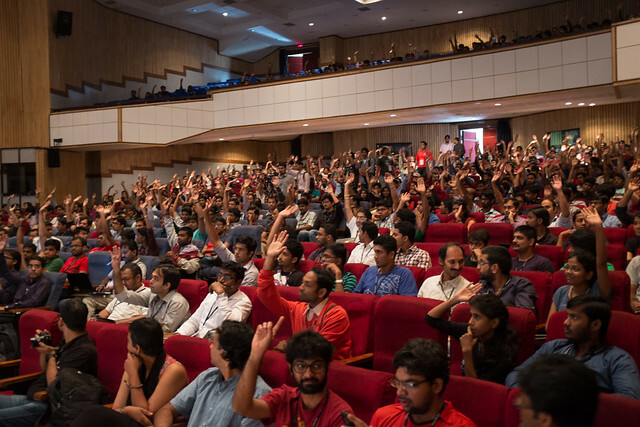 We had around 1200+ participants this year, which made it the largest PyCon India ever. 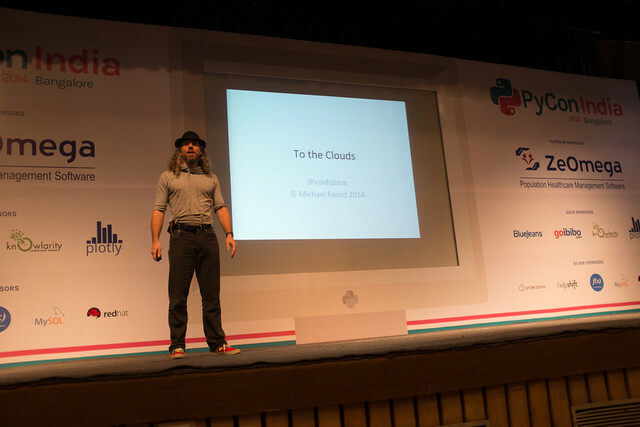 You can find all the photos from PyCon India 2014 in the right place.